The Irish Terrier is devoted to his owners and sensitive to their moods. The breed was once referred to as the Irish Red Terrier to distinguish it from other terriers in Ireland. The Irish Terrier is an extremely healthy breed. There have been rare cases of palmoplantar hyperkeratosis, more commonly known as cracked or corny pads, when the skin on the feet thickens and becomes cracked or ulcerated. There are no recommended health tests for the Irish Terrier, but as with all puppies make sure you buy from a reputable breeder. If possible, visit the breeder more than once and don't be afraid to ask questions. A responsible breeder will be happy to answer your questions and will be interested in you as a potential owner. If you have any doubts, do not buy. The Irish Terrier is devoted to his owners and sensitive to their moods. He has a gentle disposition and a great sense of humour. He can be reckless and daring. He isn't aggressive but will stand his ground. The Irish Terrier will make himself at home in the city or the country. He needs an active lifestyle with regular walks and stimulation. The Irish Terrier is a good companion for children, but as always, interactions should be supervised. The breed thrives on human company so wouldn't cope well with being left alone for long periods. Although not naturally obedient, the Irish Terrier is intelligent and eager to please - with regular training he can learn almost any dog activity. He has a short attention span so keep training sessions short and interesting. He is generally easy to house-train. The Irish Terrier has a harsh and wiry coat that requires regular grooming, usually more than once a week, which should begin when your puppy arrives home. His coat will need to be stripped twice a year to remove dead hair and allow new coat to grow through. The breed was once referred to as the Irish Red Terrier to distinguish it from other terriers in Ireland. Many owners think the Irish Terrier can understand conversations, and admit to spelling out words or speaking another language if they don't want the dog to know what's being said. 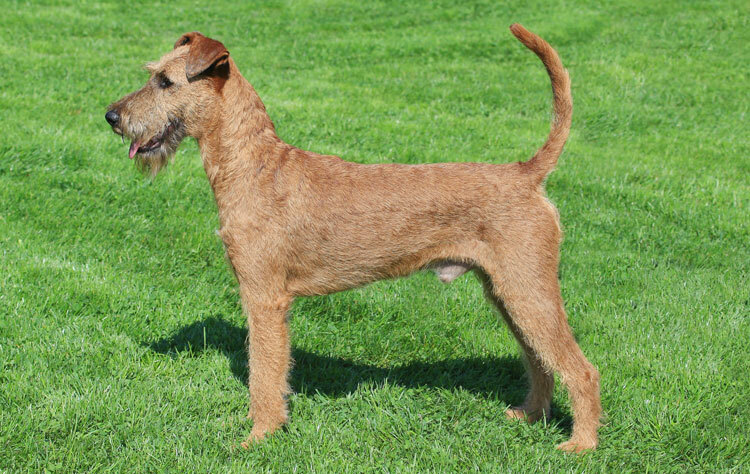 The Irish Terrier was first shown in Ireland in 1875.